Results 2010-2015 San Marino - Aldo Simoncini (34 33:35) Danilo Rinaldi (65 64:24). 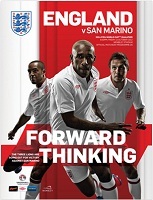 San Marino kicked-off. 96 minutes (48:12 & 48:03). 34 (24 March 1978), Kaunas, FIFA listed 2008. Assistant Referees - Vytautas Šimkus, 37 (13 January 1975), and Saulius Dirda, 39 (31 October 1972). Fourth official - Sergejus Slyva, 31 (10 October 1980), Kaunas. ELO rating =5th Colours: The 2012 home uniform - White v-neck collared jerseys with red piping on collar, white shorts with red trim, white socks with two-tone red hoop. Capt: Wayne Rooney, second captaincy. 10th match, W 7 - D 3 - L 0 - F 20 - A 5.
unused substitutes: 12-Ashley Cole, 13-John Ruddy, 14-Joleon Lescott, 15-Ryan Shawcross, 16-James Milner, 18-Adam Johnson, 21-Jermain Defoe, 22-Fraser Forster. Capt: Alessandro Della Valle Manager: Giampaolo Mazza, 56 (26 February 1956 in Genova), appointed 1998. Simoncini cautioned in the 35th minute for unsporting behaviour, diving at Welbek's feet and bringing him down in the penalty area. Penalty. Rinaldi cautioned in the 65th minute for unsporting behaviour, for a foul on Tom Cleverley in the middle of the field. unused substitutes: 12-Federico Valentini, 14-Gianluca Bollini, 16-Manuel Marani, 17-Pier Filippe Mazza, 19-Damiano Vannucci, 20-Matteo Vitailoi. This was one of those games that players sometimes dread, games you know you should win, and win well, but the job still had to be done and in the main England did just that. San Marino really are the minnows of the group, in fact, the minnows of World football, so it was an unenviable task for England at Wembley. However, they knuckled down to their task well and it was soon evident how the pattern of the game would develop. England had all the possession from the first whistle and as early as the third minute Alex Oxlade-Chamberlain was firing in a fierce long range shot. Goalkeeper Aldo Simoncini, whose name you will see mentioned a great deal in this report, made the first, and probably best, of his many saves, when tipping the Arsenal player's shot over the bar. The goalkeeper was then in the action two minutes later, but this time for a very different reason. Theo Walcott was sent clear and Simoncini rushed out of his goal to meet Walcott on the edge of his goal area but inside the box. To call the challenge reckless would be kind on the keeper, and Walcott felt the full force of what was a, Saturday afternoon at the local park, kind of challenge! The winger was taken out of the match, literally and eventually taken off to hospital, such was the concern for his injuries. The referee meanwhile deemed the challenge fair and didn't even book the goalkeeper. The least it should have been was a yellow card and a penalty! Aaron Lennon was sent on to replace Walcott when it was realised the number seven was out of the game, and over the next few minutes Wayne Rooney almost put Tom Cleverley through, then missed with a header following a Leighton Baines corner and finally saw a shot somehow scrambled away by Simoncini, a good start for the newest England captain, in his first day on the job. On 26 minutes Rooney headed over from a good position and as soon as England tried to progress through the middle they were crowded out by the number of players San Marino packed the edge of their box with. The key was obviously to attack wide and Baines was especially lively down the left. Lennon, too, looked good and after one clever move with Cleverley a cross came in and Rooney headed wide when he really should have scored. Just after the half-hour mark there was a flurry of activity as good work by Danny Welbeck set up his club colleague Michael Carrick and the midfielder fired in a terrific shot which beat the goalkeeper but crashed back off the crossbar. Welbeck was following up but was off balance and he could only manage to hit the post with his shot. A real double let-off for the visitors but a minute later, the breakthrough finally arrived. Welbeck attacked through the inside-left channel and as the keeper came out for another of his reckless challenges, this time Welbeck touched the ball around him and the goalkeeper's momentum brought the striker down. This time the punishment fitted the crime as a booking and a penalty award followed! With Frank Lampard missing from the team it was left to the skipper to take the responsibility for the spot-kick. He duly whacked the ball into the net for his first goal of the season. On 37 minutes, just two minutes after the first goal, England doubled their tally. This time a lovely pass from Cleverley, who was having an excellent game, sent Lennon free. His cut back from the byeline was flicked in by Welbeck at the near post, in a similar way to the goal he scored in the Euros against Sweden. It was all England now, as it had been from the first whistle, and Rooney had another go with Simoncini diving full length to tip the ball around a post. Then in injury time of the first-half Oxlade-Chamberlain forced the goalkeeper into another good save. It was eight minutes after the restart before England created their next chance. They had all the possession but lacked a few ideas when it came to the final third of the pitch. But on 53 minutes Carrick should have scored only for his shot to be blocked by the legs of the diving Simoncini. A minute after that miss Gary Cahill somehow contrived to mishit a shot when it seemed he must score. The pressure continued though and Oxlade-Chamberlain had yet another shot scuffed away by the overworked goalkeeper. Baines then sent in a series of crosses, all of which came to nothing, and at this stage England were permanently camped in and around the San Marino penalty box. It was surely just a matter of time before another goal arrived. To be fair England kept their patient build up going and continued to pass and move well. It was only that final pass that was missing. For their part San Marino defended stubbornly, it was all they had to offer, and their defenders kept putting in a toe or two to thwart the England attack. Baines then scraped the bar with a free-kick whilst Danilo Rinaldi was booked for a foul on Cleverley. Shortly afterwards though the San Marino lone forward raced clear and for a split second it looked as though England would be caught out. But Rinaldi shot woefully wide and still Joe Hart had not had to use his hands. On 66 minutes Jonjo Shelvey made his England debut for Carrick and almost immediately Lennon's cross only just eluded Welbeck. Finally, on 70 minutes, England scored that elusive third goal. It stemmed from a lovely long raking pass from Shelvey out to Baines. The full-back headed across goal, Lennon touched it on and Rooney curled a delightful shot home with panache, his second of the night and a goal that takes him ahead of Alan Shearer, Nat Lofthouse and the one and only Sir Tom Finney in the England goalscoring chart. Rooney is now on 31 goals for his country, not a bad way to celebrate being captain for the [second] time. Just as in the first half, one goal was quickly followed by another. This time good work down the right between Walker and Cleverley ended with the latter crossing low and hard to the near post. Welbeck was alert and quickest to the ball as he, too, scored his second of the night. On 72 minutes Rooney's work was done as he was taken off to be replaced by Andy Carroll. San Marino also made changes but the pressure continued and Shelvey could have capped his debut with a goal but shot weakly. But on 76 minutes England rounded off the scoring with a delightful moment. More fine play by Baines, Welbeck and Cleverley saw the ball drop to Oxlade-Chamberlain, and the youngster created history with his goal. It was the first time a father and son had scored for England, as his father Mark had scored for England way back in 1982 against Luxembourg. Now his son Alex had done it too, and it was a good goal as he managed to clip a clever shot over the keeper's head. Other chances came and went as the half drew to a close, notably when Shelvey and Oxlade-Chamberlain had further efforts on goal. In the 92nd minute there was a first, as Hart managed to touch the ball with his hands for the first time. So ended an easy win for England, as expected, but good performances, especially from Baines, Cleverley, Rooney, Welbeck and Oxlade-Chamberlain will give Roy Hodgson food for thought. Now he must ponder his selection for the much harder task that awaits in Warsaw. As for San Marino, well, they worked hard in defence, didn't cave in and in Simoncini they had the busiest player on the pitch. All in all a satisfactory performance and three more welcome points for England.